A terrific concert that ended too quickly. We shuttled from Halifax, so I had to drive 2 1/2 hr today. Then they cycled 62 Km to Cape Beton, where we were treated to a free lunch. Our last day in the RV. Thanks Michael so much for driving it back to Halifax, and returning it all cleaned up. This night we sailed from North Sydney NS to Argentia NL, 17 hours. We slept in a state room with two bunk beds, the four of us together for the last night. After doing a big day yesterday, we got to wander around the beautiful city of St. John’s. That evening we enjoyed a fantastic concert featuring some great talented local musicians. Day 67, the end of a fantastic journey across our wonderful Canada. Thank you to everyone who is a part of Hillary’s Ride for Mental Health: family, old friends, new friends who we met and talked with along the way, supporters, and the board who worked so hard to make this dream a reality. 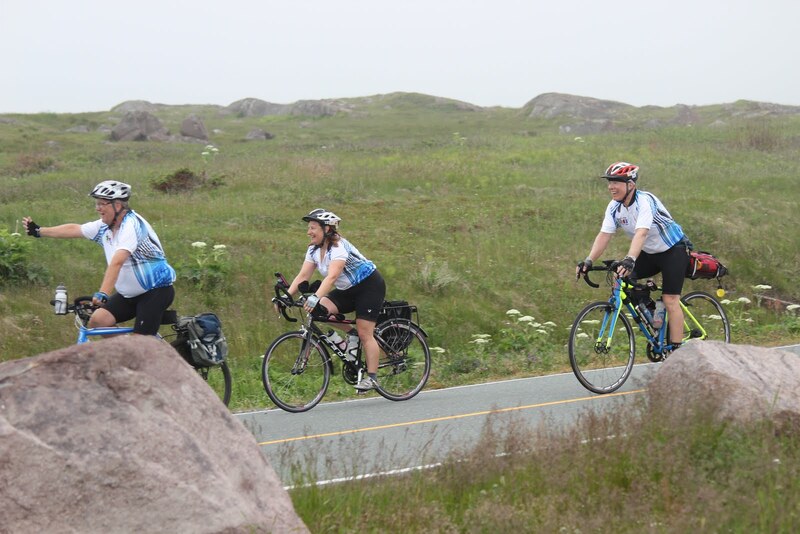 WOW, we did it – across Canada from tip to tip – Mile 0 in Victoria to Cape Spear near St.Johns’s. Over 6,700 km in 67 days. I consider myself to be so lucky, and so proud to be part of Hillary’s Ride for Mental Health. Being with Bill, Sue and Terry every day I know how hard a job it was to cycle across the country. In the past few years I had a thought in my head that I might want to try it, but no way now. I am happy I was able to be able to share our trip in pictures with those of you who followed us along the way. Thanks for your comments. Pretty amazing what you guys did – serious kudo’s! Also, thanks for supporting them Al, & for all the pictures.